Alkaloids from amphibian skins (J.W. Daly et al.). Naturally occurring cyclotryptophans and cyclotryptamines (U. Anthoni et al.). Recent research on pyrrole alkaloids (P.W. LeQuesne et al.). Recent developments in the chemistry of norditerpenoid and diterpenoid alkaloids (B.S. Joshi, S.W. Pelletier). New approaches to the syntheses of piperidine, izidine, and quinazoline alkaloids by means of transition metal catalyzed carbonylations (I. Ojima, D.M. Iula). Subject index. Organism index. Volume 13 of this series presents five timely reviews of research on alkaloids such as new developments in the chemistry and biology of alkaloids from amphibian skins. It provides a synopsis and tabulation of the hundreds of alkaloids that have been detected, with an emphasis on occurrence, structure, dietary origins, and biological activity. Alkaloids containing the 1, 2, 3, 3a, 8, 8a - hexahydropyrrolo [2,3b] indole ring system and the cyclotryptamines are discussed. An exhaustive list of available structures is provided. The chemical and biological structures have been evaluated critically so as to identify existing errors and expose irregularities in appearance or biological function. In addition, attention is drawn to the possible implications of the accumulated knowledge related to the synthesis, occurrence, and biochemistry of this class of alkaloids. Recent work on alkaloids containing the comparatively non – basic pyrrole ring system is summarized. 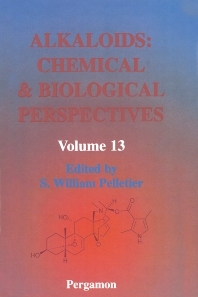 One of the chapters covers isolation, structure elucidation, biological activity, and selected chemical syntheses of certain pyrrole alkaloids. Recent developments in the chemistry of diterpenoid and norditerpenoid alkaloids occurring in Aconitum, Delphinium and Consolida genera of the Ranunculaceae family used in Chinese and Indian medicine are surveyed and the book ends with a focus on transition metal – catalyzed carbonylations as efficient and novel approaches to the construction of piperidine, izidine and quinazoline alkaloids, which occur in great numbers in nature. For scientists working in the fields of natural product chemistry, medicinal chemistry, pharmacology and biochemistry.